I can't get Cocoa Bindings and Core Data to work and I can't figure out where to find my answers. 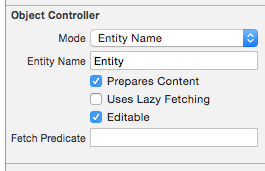 I have an Entity Core Data Entity, with a text attribute. 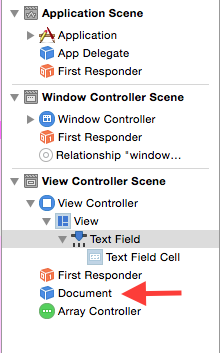 NB: This is the new Storyboards Document-based Xcode Template, so it has a View Controller in it and there's no link between the Window Controller and the View. 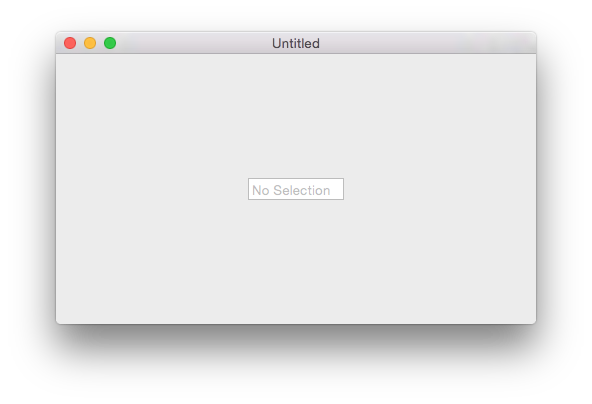 Additionally, the Window Controller does not have a 'File's Owner'. 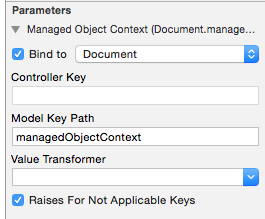 So, in order to have access to the Document's managedObjectContext I dragged in an Object and set its class to Document. I then bound my Array Controller to that Document Object's managedObjectContext. This all auto-completes so I'm assuming it's connecting right. 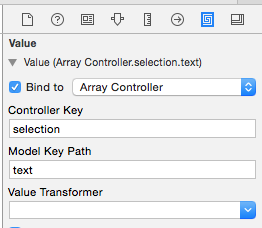 I have an NSTextField in my view, and I bound that to the Array Controller's selection's text property — again, this autocompleted. What am I doing wrong? Is the Cocoa Bindings part, the Core Data part, or something else that I'm not using correctly? My interpretation is that while everything is bound correctly, the NSManagedObject is either not getting created or it's being created after the Array Controller can see it. I thought the point of this template was that it set everything up for you. If you tell me to read Apple's Documentation, please point me to the right starting point because I have spent two days poring over the relevant Class References, Core Data and Document-based Application Guides, and Cocoa Bindings docs and I can't figure out what I'm doing wrong. Browse other questions tagged macos cocoa core-data swift cocoa-bindings or ask your own question.